Well, it would appear someone has done just that. 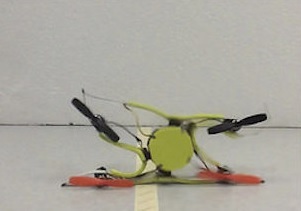 The crash resistant quadcopter is composed of a flexible frame (obviously) which is held rigid with magnets. So the frame works just like the frame of your average quad. Until you crash it, of course. Then it becomes flexible. The idea came from the wing of a wasp, which you can apparently crumple without damaging it. Be sure to check out the video below of the drone showing off its flexible frame, and let us know if you’ve seen any other types of flexible frame drones in the wild. Thanks to [JDHE] for the tip! Quadcopters are useful little flying machines. They can be used in all sorts of applications, from mapping, to inspecting long pipelines, to border surveillance, or simply for fun. They all have one thing in common, however – a relatively short battery life. Because quadcopters use brute force to churn through the air, they require a lot of energy. More energy for longer flights means more batteries. More batteries means more weight to carry, which requires even more energy. If you want longer flight times, something has to change. Or does it? A small start-up company called Horizon Unmanned Systems based out of Singapore claims their quadcopter can fly for up to four hours on a single charge, or up to two and a half hours carrying a 2.2 pound load. They claim to be able to pull this off with a novel approach. First, they fill the hollow frame of the quadcopter with hydrogen gas. They use that gas to power a cute little miniaturized fuel cell LiPo battery hybrid gizmo. And that’s about it. The rest is just standard quadcopter stuff. The secret to all of this is the miniaturized fuel cell, and how it works. Unfortunately, this is as close as we’re going to get (pdf) for a datasheet. Fuel cells are nifty devices that take hydrogen and oxygen and convert them into water, along with electricity. While that sounds simple, making one is not. And making a miniature one light enough for a quadcopter is down right hard. How would you increase the flight time of quadcopters? Fuel cells are a great idea, but is this technology within the reach of the modern hacker? 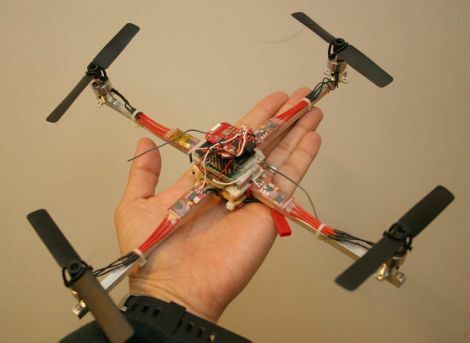 We’ve seen people make them from scraps out of a junkyard, but how would you miniaturize it and make it light enough to be used as a practical power supply for a quadcopter? Thanks to [Joseph Rautenbach] for the tip! As kids we’ve all let a friend use a toy only to have it returned broken. That was such a bummer! At least that was years ago though…. well not for [Tom]. He had a Hubsan X4 mini quadcopter that he had crashed into all sorts of things. The little quad held up good against all of the beatings so [Tom] didn’t think too much about letting his pal take it for a test drive. Thirty seconds later, several separate pieces of the quad were laying in the dirt. A new X4 was ordered but there was some time to kill waiting for it to show up. Since the electronics seemed to be intact and only the frame was broken [Tom] decided to try his hand at making a new frame. Keeping costs under control is an important part of any project and this one was no different. The frame would be made of cheap and rigid 5mm plywood. The only potential problem would be the weight. [Tom] cut out a piece of the plywood and weighed it, then measured the volume and calculated the density of the wood. The wood’s density was used to estimate the final weight of new plywood frame designs and shapes. This worked so well that the newly built quad only weighed more than the original by 0.31 grams, less than 1% increase in the total weight! The advancement of Quadcopters and their capabilities over the last few years has been amazing. Unfortunately, the price point to get into the sport with a decent size, non-toy, vehicle is still several hundred dollars. And what’s the fun with buying one when you can built it?!? Strapped for cash and feeling the same way, [Hans] over at the hackerspace Knackatory decided to build a quadcopter from e-waste. The + shaped frame is made from lightweight plywood. It’s pretty obvious that the main rotors are PC Fans, 140mm in this case. Normally, these wouldn’t be able to create enough lift to get out of their own way except the on-board 24v Dewalt cordless tool battery bumps up the fan speed to 15,000 rpm. The one orange fan allows the operator to maintain a visual reference to which side of the ‘copter is forward. [Thanh] has spent some time flying quad-copters measuring 12” motor to motor, but wanted to build something smaller so that he could fly indoors. Instead of building just one, he actually constructed five different quad-copters, with motor to motor arm spans ranging from 10” to just 3”. In his forum post, he highlights the construction process of his 10” copter, covering each step in great detail. While he breaks down his component lists into two categories based on motor to motor span, the one common item is the TI MSP430-based controller board. In particular, he used the eZ430-RF2500 development kit, which has the added benefit of a built-in 2.4 GHz wireless radio. His quad-copter uses a Wii Motion Plus gyro board to help keep it aloft, as well a handful of other components which should be pretty familiar to most of our readers. It’s great to see the construction broken down in such detail, we imagine it will be a great resource for anyone else looking to build their own quad-copter. Stick around to see a quick video demonstration of his mini quad-copter in action. In the video above you’ll see two of our favorite things combined, a quad-copter that is voice controlled. The robot responds to natural language so you can tell it to “take off and fly forward six feet”, rather than rely on a cryptic command set. The demonstration shows both an iPhone and a headset used as the input microphone. Language is parsed by a computer and the resulting commands sent to the four-rotor UAV. This makes us think of the Y.T.’s robot-aided assault in Snow Crash. Perhaps our inventions strive to achieve the fiction that came before it.